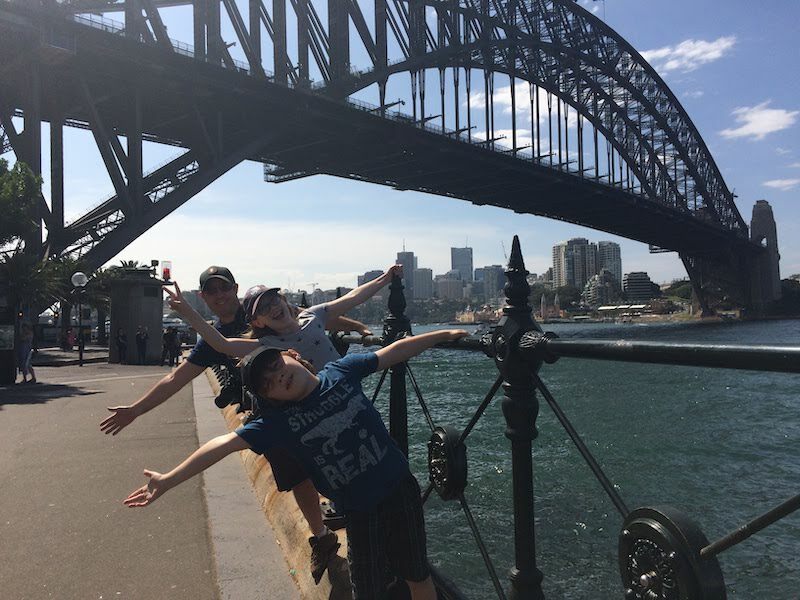 The runawayfamily goes back on the road, this time to drive the Great Ocean Road, get attacked by flies in Uluru and see the sights in Sydney. It was always going to be hard leaving. In the short time we had in Melbourne, we had already done so many uniquely Australian things. We had seen koalas, snakes, and possums stuck in fences. We had been given a glimpse of a whole different world as we watched penguins returning home. We had explored alleys, covered markets and zoos. We had gotten hair cuts from drunken barbers and sat in wizard shops. 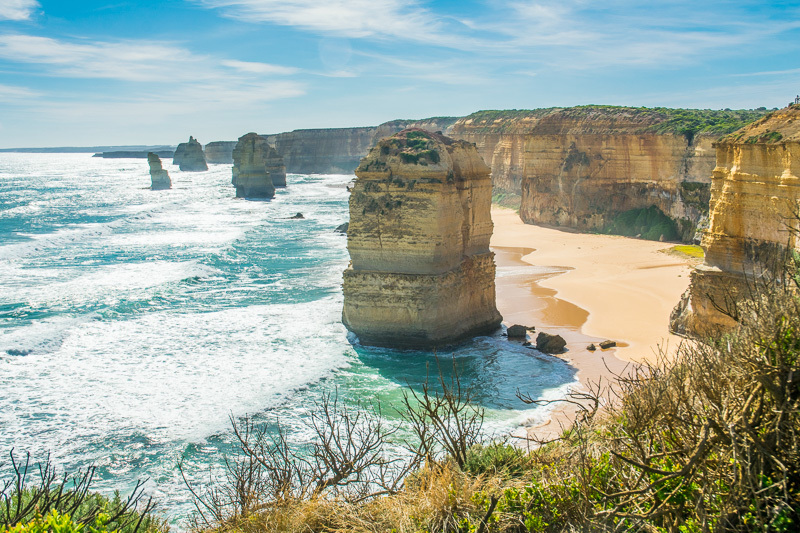 Melbourne had already made us excited to explore this vast continent masquerading as a country. And so we headed out onto the road once again. But not before hitting a few road works along the way. Australia is very fond of its road work. It does not seem that there is a road that does not need improving in Australia and you do not go very far without hitting many, many road construction sites. We giggled as we stopped at our 2000th road construction that day, on the road out of Melbourne. We were remembering the news report we had seen the previous evening where the announcer was sympathizing with a PR person for a road construction company. The PR rep was stating that they were running out of roads to fix. Hitting the next road stop 10 minutes after leaving the previous stoppage, it did not seem possible that they would run out of work for at least the next century. They needed something to do with all the pylons scattered around the road, seemingly flung there from the backs of stampeding kangaroos. I think there must be at least 5 pylons for every Australian, by the looks of things. If the road work ever finishes, I have no idea what they will do with all the pylons. Probably have to let them loose to roam with the kangaroos no doubt. No matter. We were off on our way along the Great Ocean Road. 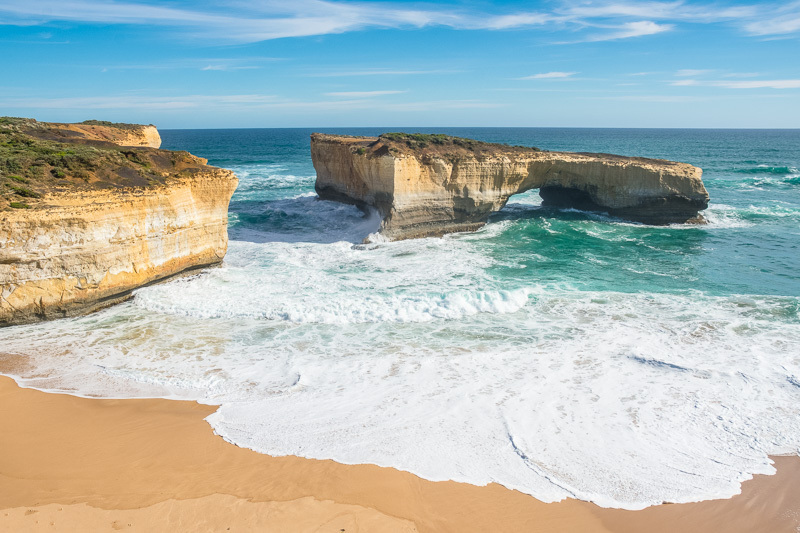 The Great Ocean Road winds its way along the southern coast west of Victoria. Our goal was to complete a circle, ending back at Melbourne in time to catch our flight to Uluru. It was going to be a lot of driving, which I knew from my experiences driving along the coast of Nova Scotia. The distances in Nova Scotia may look short but don’t be fooled. You drive in and out of coves, up and down hills, around windy bends always going somewhere between 5 and 80km/h. What looks like a jaunty little 45 minute drive through pretty little fishing villages ends with you arriving, two days of growth on your face and a confused, wild look in your eyes. Thankfully, the Great Ocean Road was not as windy, replacing the quaint fishing villages with brush swept vistas and dusty towns. Our objective was to see the Twelve Apostles. These rock formations are very pretty as the surf pounds against them. They are slowly being worn down, not so much by the water but by the blowing sand which created them from the rock cliffs in the first place. Arriving there, we were once again struck by how touristy these locations had become. 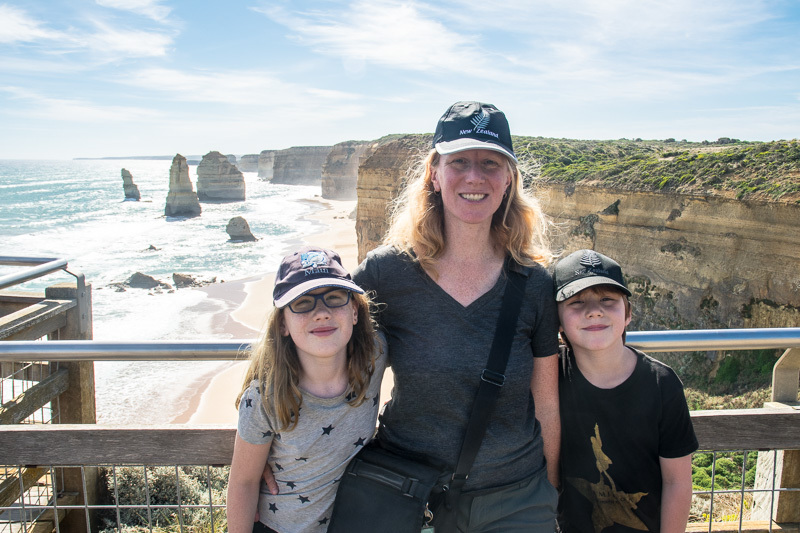 Deanne told that the last time she had visited, there was hardly anyone there and you had to carefully walk along the tiny path to reach the viewing point. Now, there is a visitor centre, paved walkways and handrails leading you – and the 15 000 busloads of tourists – safely to the viewing area. 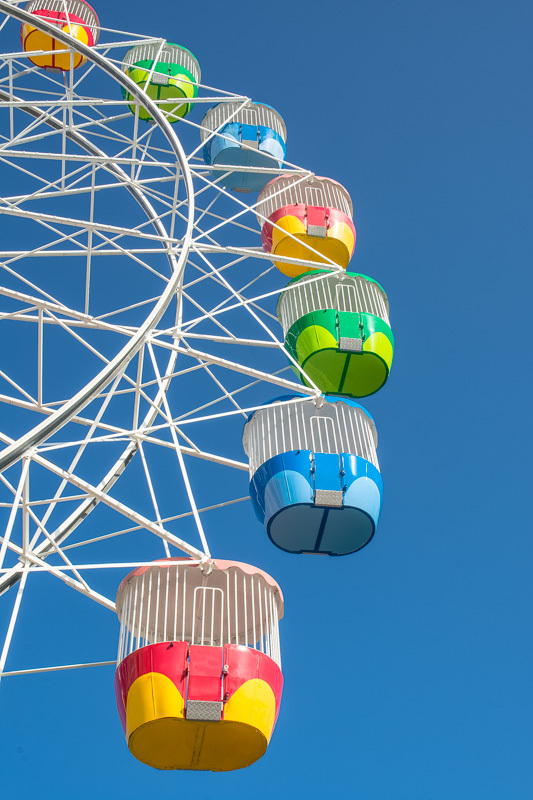 Once there, you are jostled with all the other picture takers looking for that perfect view. And it was a picturesque view! The Apostles (not twelve anymore as some of them seemed to have wandered away into the ocean), stand majestically in the water. 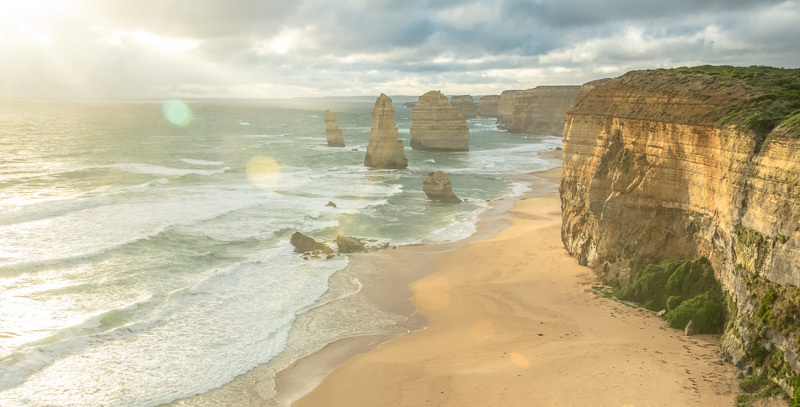 From where you stand, the rock columns look like they are fervently praying over the ocean. Despite the crowds of people, you still got a sense of peace as the sun played its light on the rocks, highlighting the stripes of minerals exposed by the wind. From there, we headed to the much quieter London Bridge rock formation. This formation has also been battered by the wind to a much more devastating effect. It used to be that you could walk over the natural bridge and go right out to the tip of the rock. That is until two groups of tourists were inadvertently left stranded on the rock when the natural bridge collapsed behind them. Helicopters had to be sent to rescue the tourists leaving them to gratefully reflect that the bridge had waited until they had crossed before collapsing. After suitably impressing our children with this story we headed on to our stop for the evening. Little did we know that we were going to encounter something exciting there as well! Later, I went back to see the Twelve Apostles again to try and capture the rocks at sunset. Once again, the curse I seem to carry with me in trying to capture sunsets and sunrises was once again with me that evening. A storm just happened to be blowing in and the sun was covered with clouds. The wind has also become much stronger and you could see, and feel, how the rocks had been created. Standing there, you felt the wind lashing you with sand and even small pebbles. Getting to Warrnambool, one of the bigger centers in the area, we settled in for the evening in a vintage motel. It was actually a very nice room which had probably been very expensive digs in the early 60’s but which was now showing its age. It still fit our needs – lots of space and good wifi – and Siena and I got comfortable while Deanne and Liam opted for a little evening stroll down to the gardens nearby. They weren’t gone long when they suddenly rushed into the room exclaiming gibberish that sounded like, “bats in the trees”. As it turns out, they actually did say “bats in trees”. 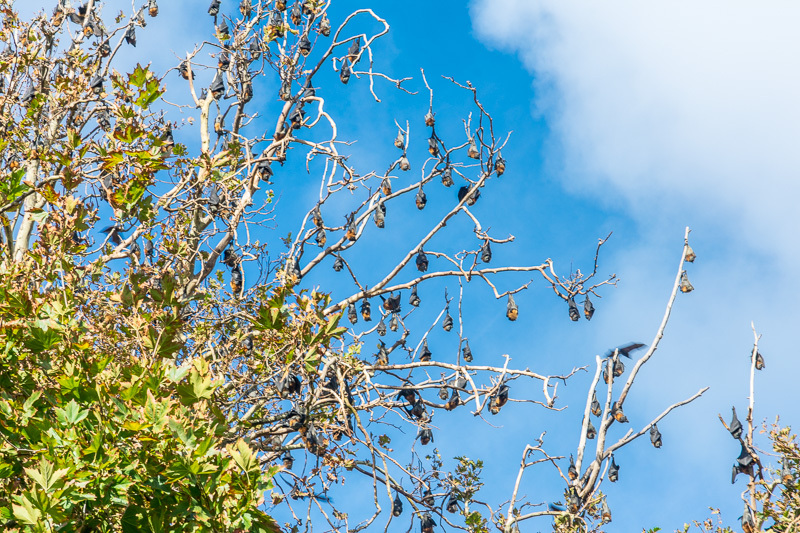 When we got to the gardens and looked up, an entire group of trees was filled with bats. 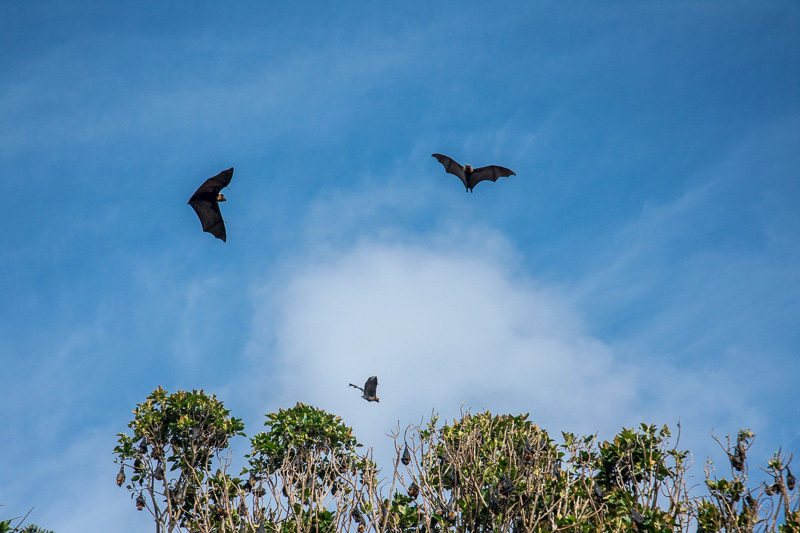 Hundreds and hundreds of bats, both hanging upside down in the trees and flying around. The air was literally full of bats. It was an incredible site. The last time I had seen that many bats was in Austin, Texas where they were roosting under the bridge. It actually reminded me a lot of the chimney swifts we had seen in Wolfville, when they would fly into the chimney in large groups at sunset. This was a lot like that. It was quite mesmerizing watching the bats flying, grabbing onto a branch and hanging upside down, all in one motion. In many places, this would be a huge attraction, but we were all alone. We read later, when Deanne looked it up, that this was quite common here during certain times of the year and that the population of bats seem to be growing. Strangely, we had never heard of it. None of the tour books mention the bats at the botanical gardens. Funny story though. 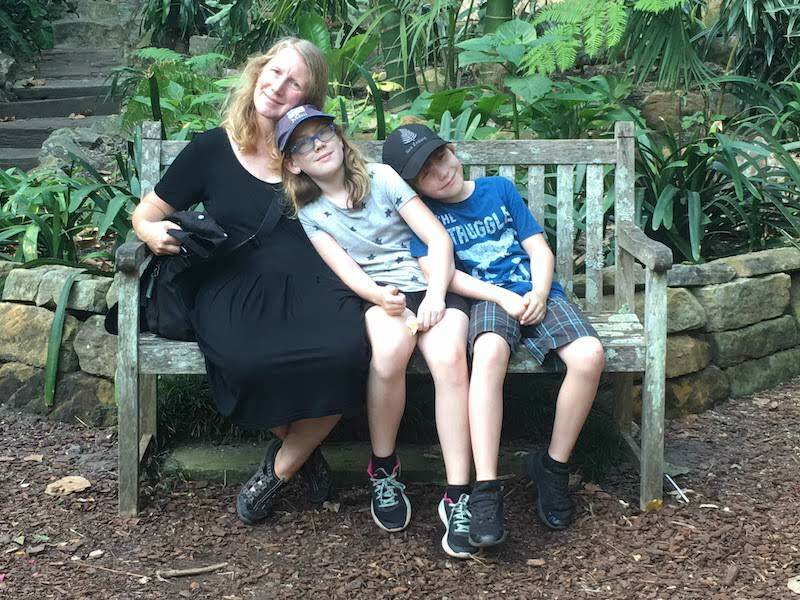 When Deanne looked closer, she discovered some reviews of the botanical gardens which mentioned – in several comments – that the gardens were quite pretty but would be much nicer if it wasn’t for all the bats. The kids were fascinated by the bats thought. In fact, we came back out to the gardens in the morning to see them again. Once again, we had the gardens all to ourselves. This time we could see the bats much more clearly. 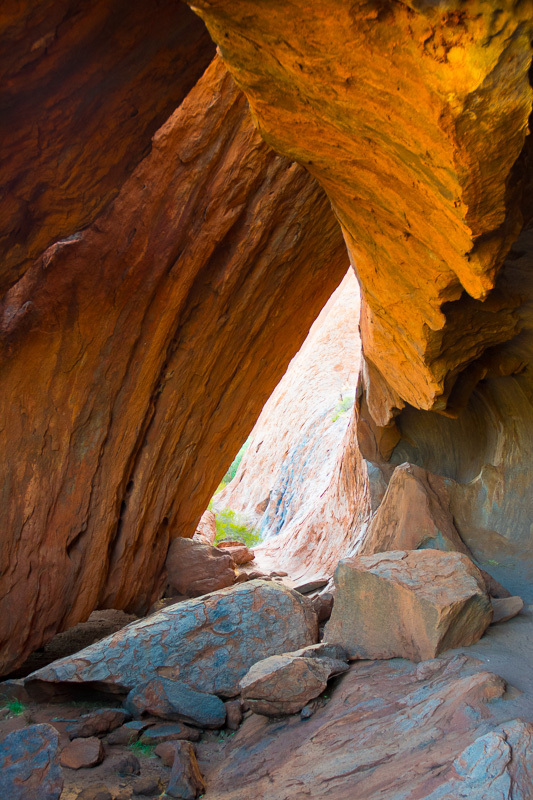 The next day, we headed back to Melbourne to catch our flight up to Uluru. Uluru was another sight I had been looking forward to for a long time. It was going to be hot, it was going to be dry but we knew it was going to be an amazing experience. What we hadn’t counted on were the flies. The flies greet you at the door of the airport and never leave you. It was a constant battle to keep the flies from crawling into very orifice on your face. I have no idea how people live and work there. The flies are a constant every time you step outside your room. Luckily our room was very nicely air-conditioned and free of flies. The whole settlement of Yuluru is owned and run by a single hotel chain. All the hotels in the settlement are priced differently depending on how much money you want to spend. It’s quite a funny little community. 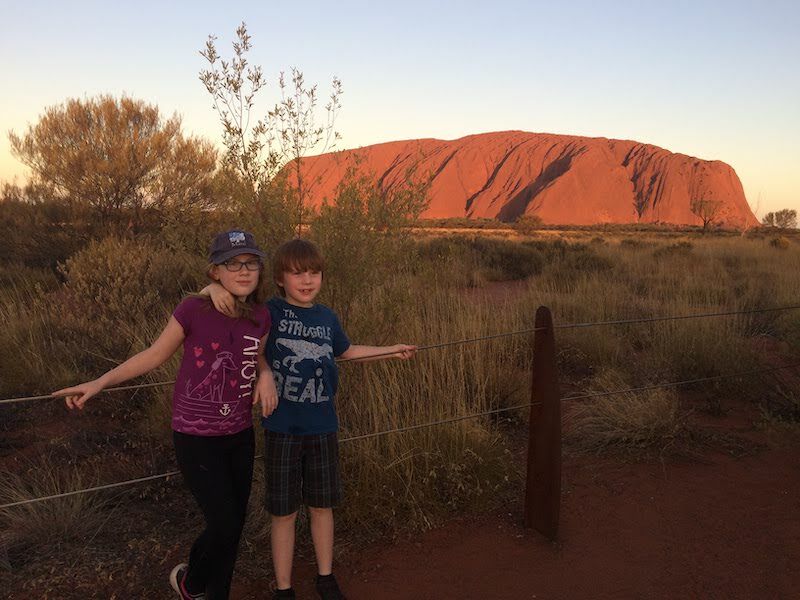 We thought Melbourne was hot but Uluru was much hotter. Even the breeze was above 30 degrees and it didn’t cool down significantly at night. Thankfully Uluru was well worth the heat and flies. 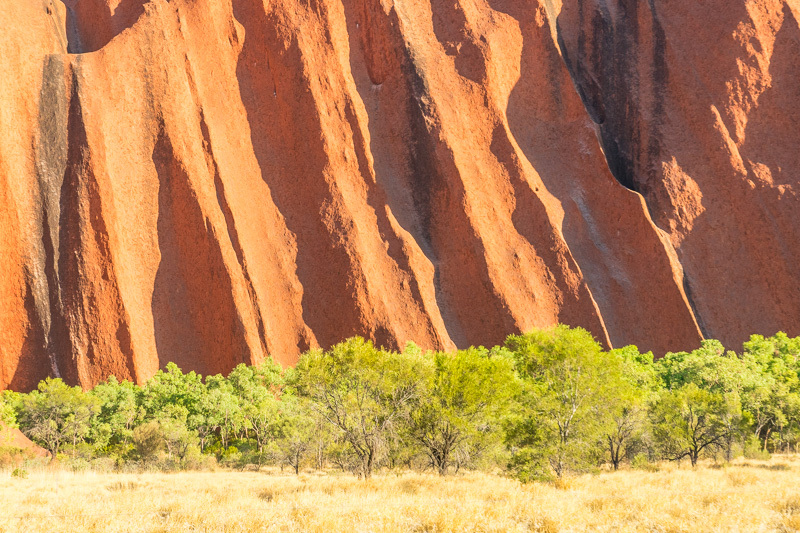 You can’t really describe Uluru other than to say that it’s a huge rock thrown on top of a endless flat landscape of brush and dirt. Liam described it as a rectangular cake sitting on a plate with red icing layered on top. But this wouldn’t really describe the full effect of Uluru as you drive the road towards it. It rises up out of the outback like some vast majestic king of the desert. Then you get out of the car and this spiritual feeling washes over you causing you to just gaze in dumbfound awe at this thing, this piece of rock sitting in lonely solitude in the middle of nowhere. 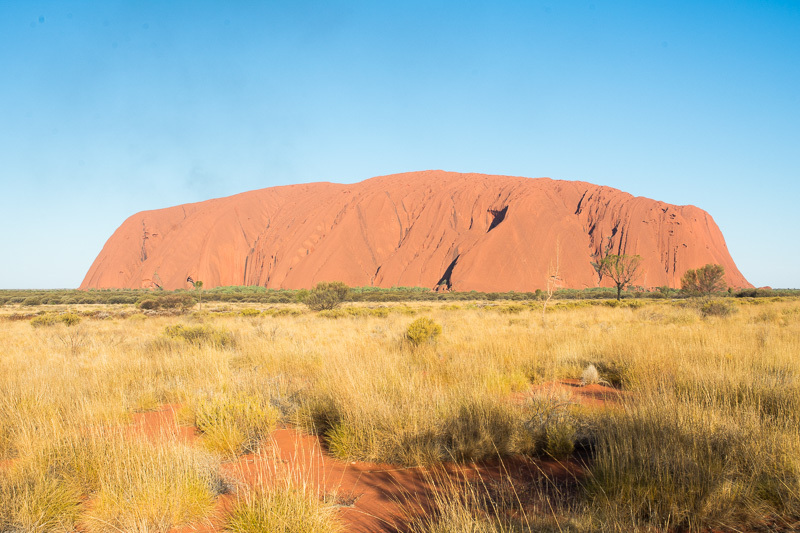 Of course, there is a boring piece of scientific reasoning behind Uluru explaining that the rock is just the tip of an iceberg like formation that continues on under the ground created from the layers of sediment pushing together and being exposed over time by wind. 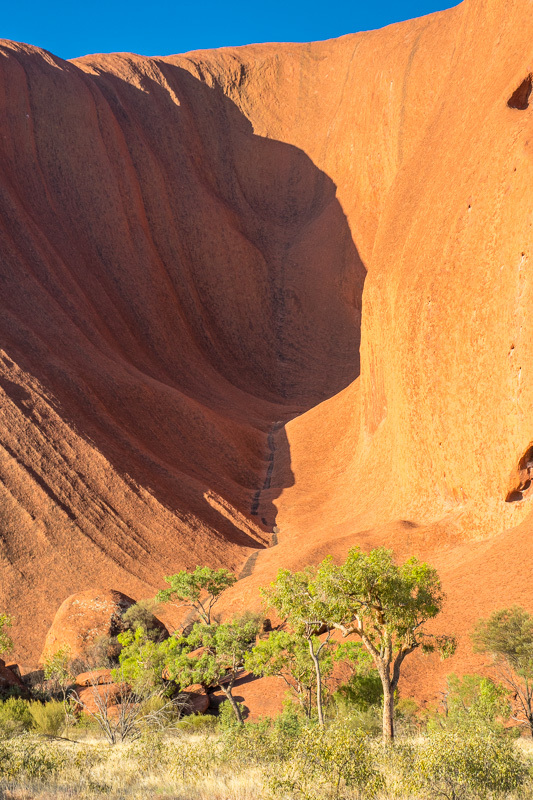 However, the indigenous people understood there was something deeper to Uluru than just layers of rock. You couldn’t help feel this as you stared at the rock in the dying light of the day, the red stone deepening in colour as the sun set. 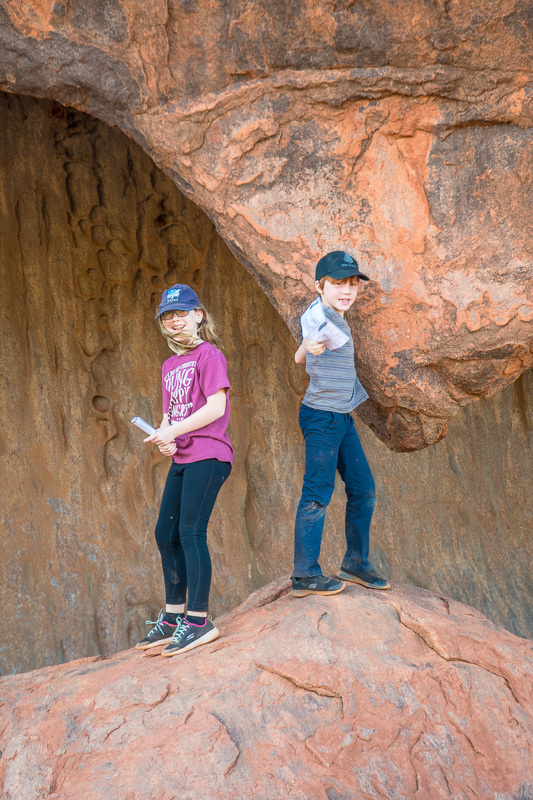 We spent two days in Uluru. Unless you were willing to spend lots of money, that was really all the time we needed. We visited Uluru the next morning to watch the sunrise on the opposite side of the formation, then we attempted to do the free guided tour around the base of Uluru but the flies got the best of us. We did get to see the rock carvings made by the indigenous people who used the carvings as teaching tools for the next generation. 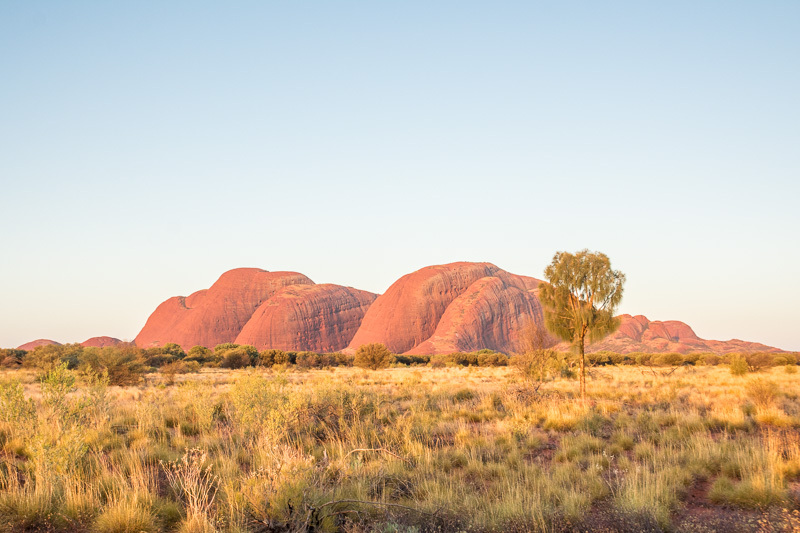 Nearby, the not quite so famous, Kata Tjuta formation loomed over the Outback about 45 mins to the west of Uluru. We visited this formation one evening but weren’t able to get very close, for better or worse. Leaving Uluru for Sydney, we were so thankful that we had been able to visit this amazing place. No trip to Australia would have been complete without a trek out to Uluru and we felt blessed to have been able to see this amazing creation. 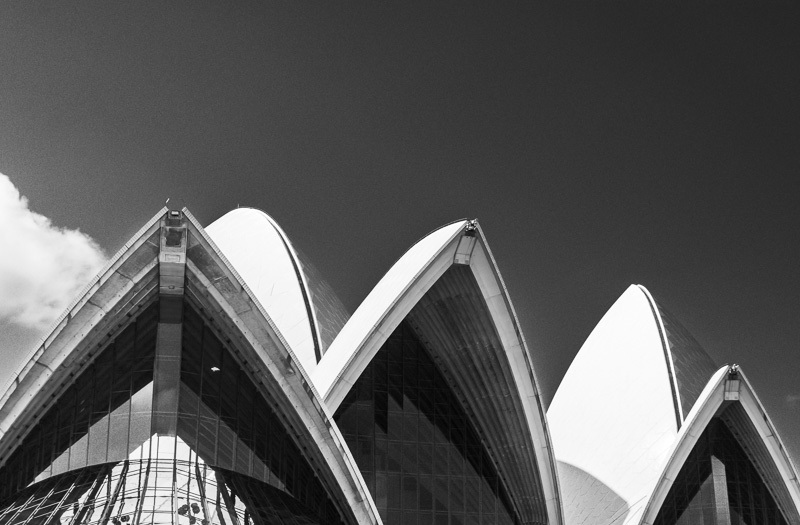 Sydney grew on us as we came to discover some of the more interesting parts of the city. It took awhile though. 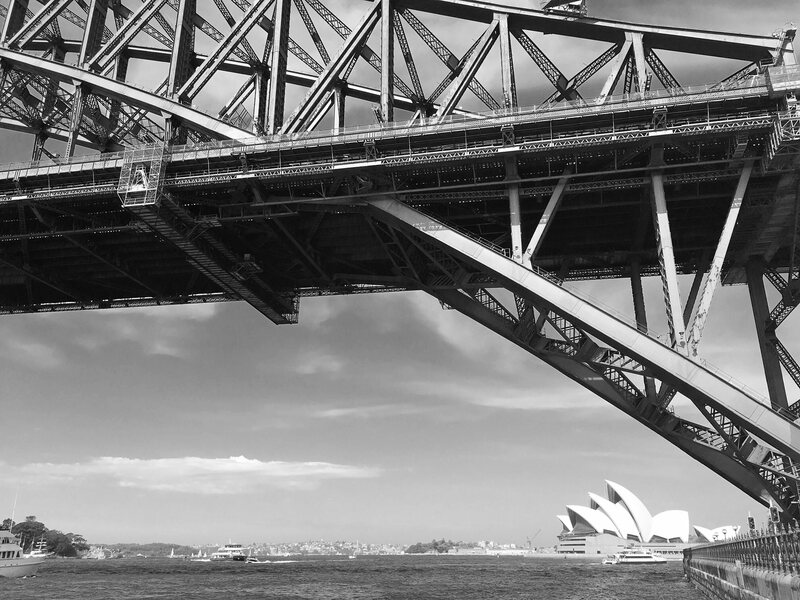 Sydney is not immediately likable. 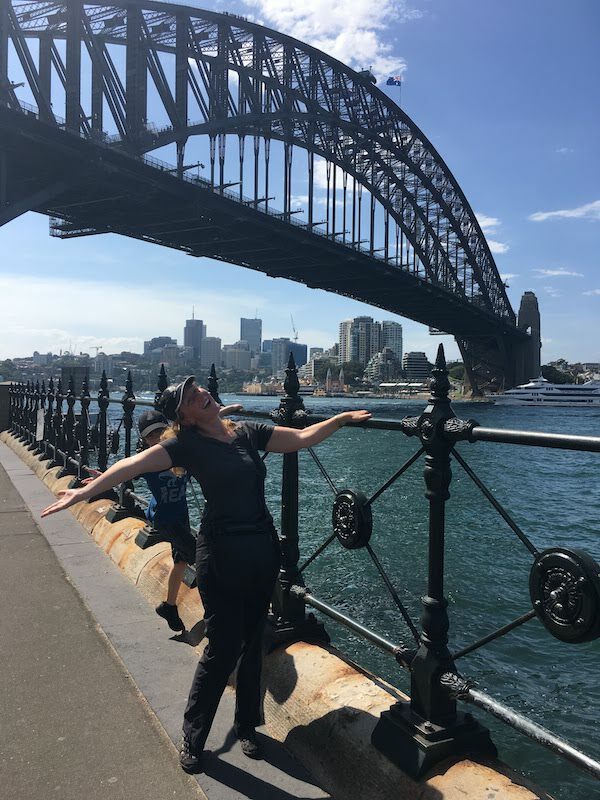 Maybe it was our location in a slightly rougher area on the outskirts with the nearest grocery store a long trek away or maybe it was the hour train ride into Sydney proper every day. It wasn’t Melbourne but that was always going to be hard to live up to as we had enjoyed Melbourne immensely. One of our first forays into the city was to the Sydney Opera House. We had tried to find tickets to one of the performances held there but unfortunately, we had arrived just between events and there wasn’t anything really suitable. However, just wandering around the building was breathtaking. Seeing it on a postcard is one thing. Walking around it was something entirely different. 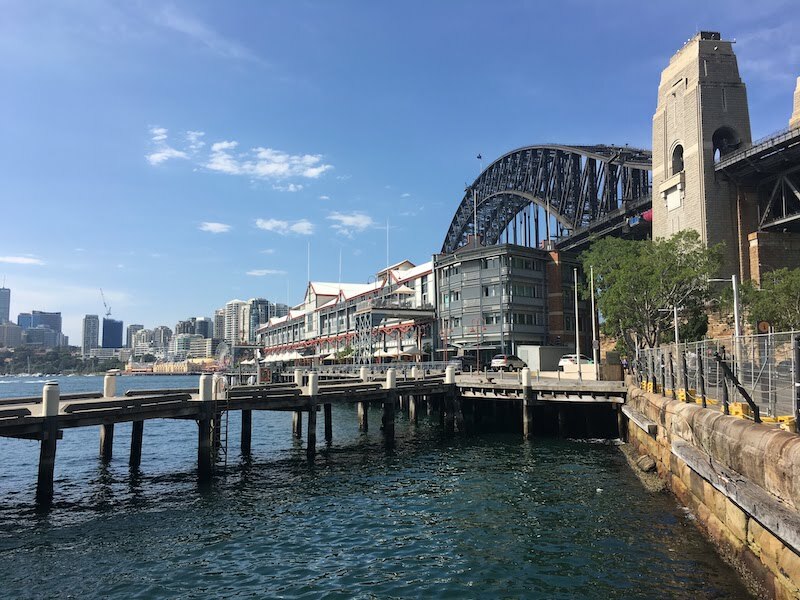 It was an amazing space with the building soaring over the harbour, it’s sails piercing the sky and cafes all along the harbour area packed with happy throngs of people. Liam was thrilled to be able to pick up the Sydney Harbour lego set, a cool set not available anymore and I picked up a Sydney Opera House shirt much to my wife’s chagrin. If you know me, you’ll now that I am a sucker for cool t-shirts which Deanne doesn’t understand and tries hard to ensure doesn’t get completely out of control. 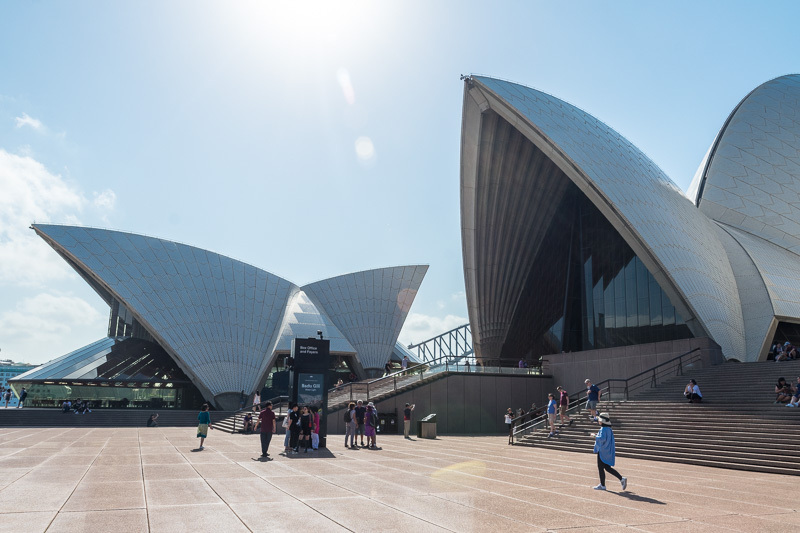 The whole area around the Opera House is an amazing walk. The Lonely Planet book had a really nice walking tour which we headed out on. 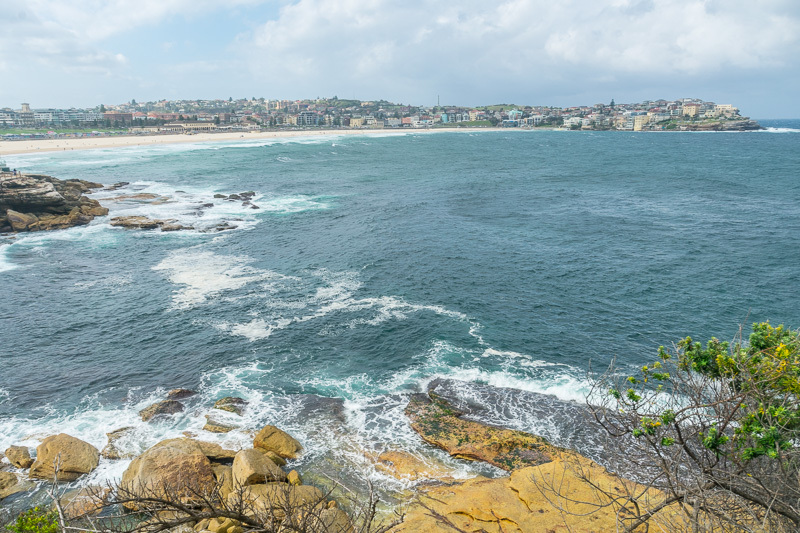 The walk takes you through “The Rocks”, one of the first populated areas of Sydney when the British first landed and began to populate the country. 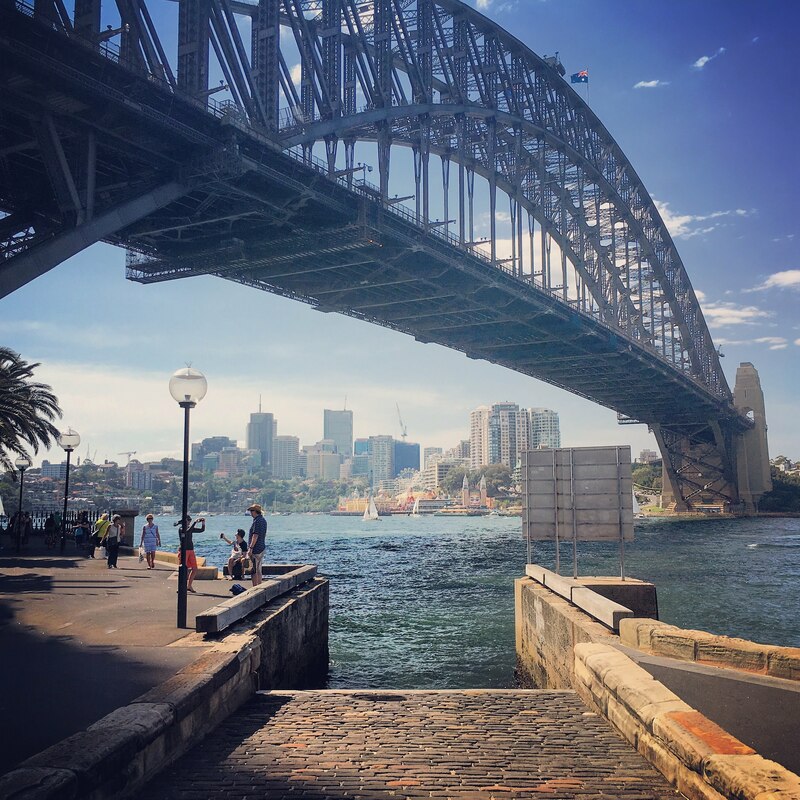 Lots of cool alleys and streets lead you, first under the famous Harbour Bridge, then through the genteel streets in and around the bridge. 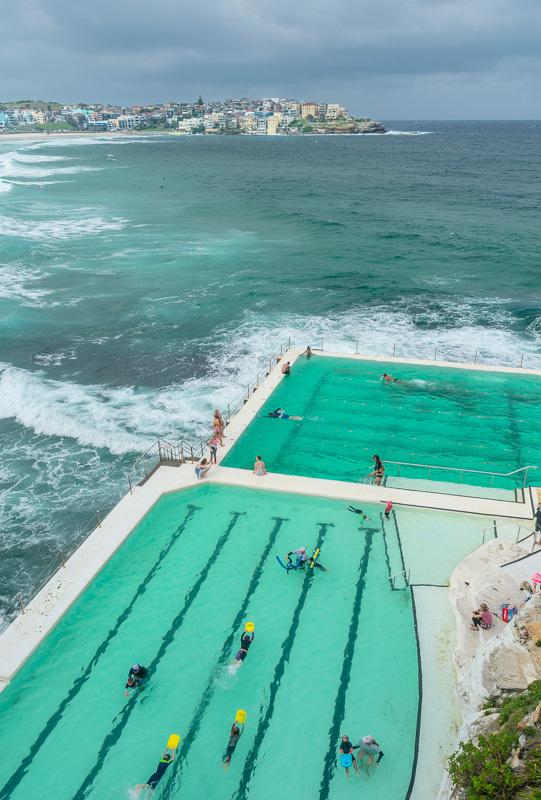 This used to be the seediest part of Sydney – parts even experiencing the remnants of the black plague – now it had been taken over by people with far more money. The streets were lovely, old church and homes gracing the once dirty and grimy roads and pathways. We made a brief stop at the oldest pub in Australia, which was a lot of fun. I love these old pubs with the rich wood counters, small rooms and cozy atmosphere. Then meandered our way back to the Opera House before calling it a day and heading back to our apartment. On another day, we headed out to the Blue Mountains. 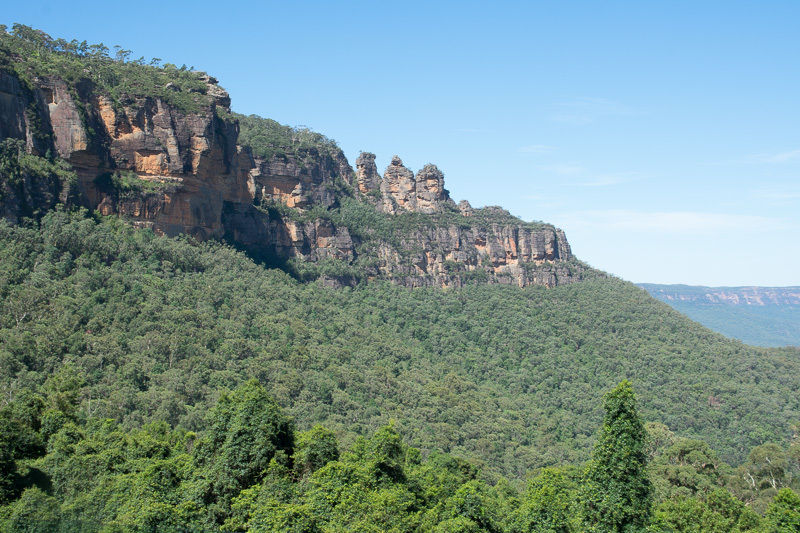 Sydney was stinking hot but the Blue Mountains offered a cooler respite from the heat. 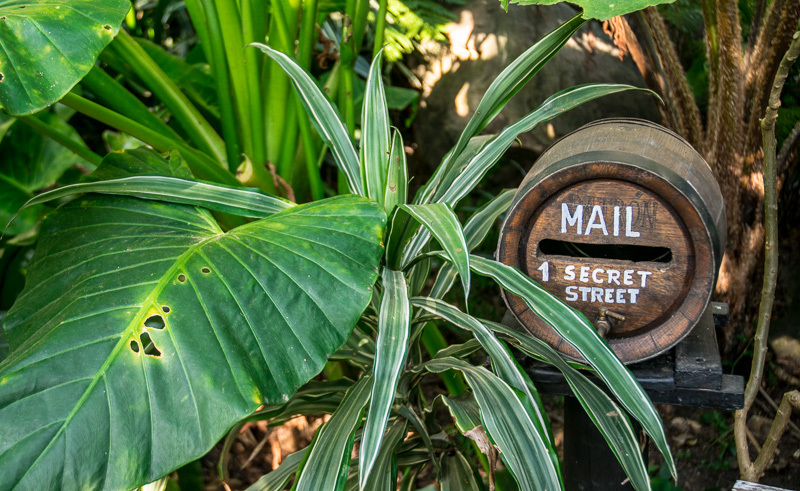 Scenic World was a neat collaboration between the parks and the private company that owned the site. 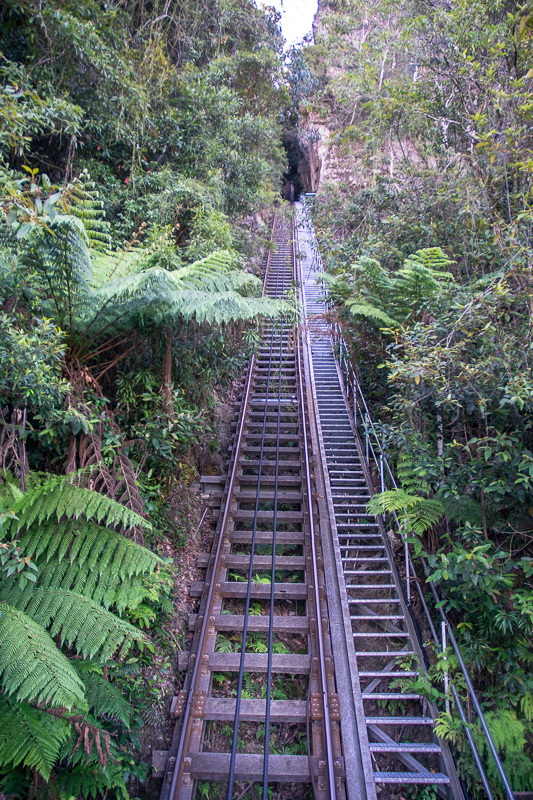 At Scenic World, they offered gondola rides through the valley, as well as the world’s steepest railway. 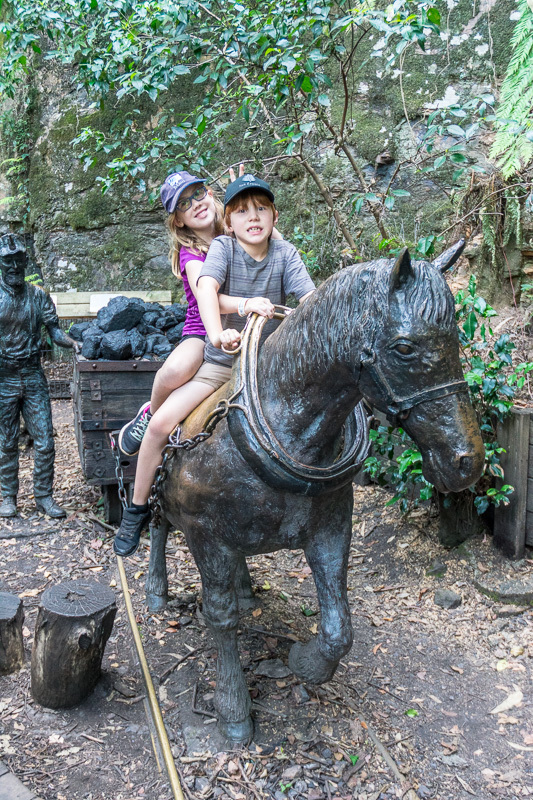 The railway had originally been built to get the miners down into the ore deposits but had then been turned into a ride you could take to get to the park trails leading you into the valley. The name certainly fit the ride. Riding along at a 52 degree incline, you have to hold on tightly so you don’t fall from your seat onto the neighbours below you. Piping in the Indiana Jones theme music, you certainly felt like you were going on an adventure, though one complete with safety cages and handle bars. We had lots of fun wandering through the trails. The kids loved the train and we took it several times, each time being just as fun for the kids as the last. Later in the week we headed over to the Science Museum. We had not had a lot of luck with the Sydney museums to this point. They had been a little disappointing in their displays and size. However, the Science Museum was an amazing place. 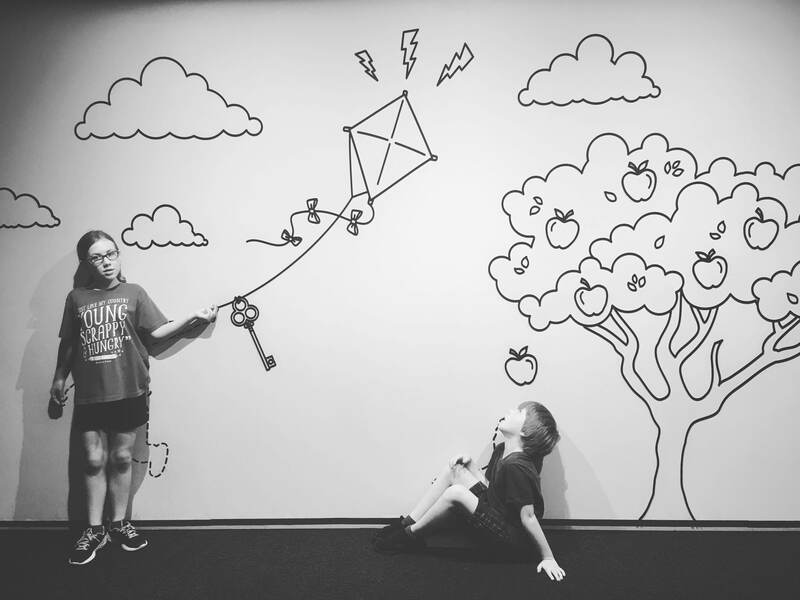 The kids love anything that is interactive and, by the end, we were wishing we had made more time for the museum. 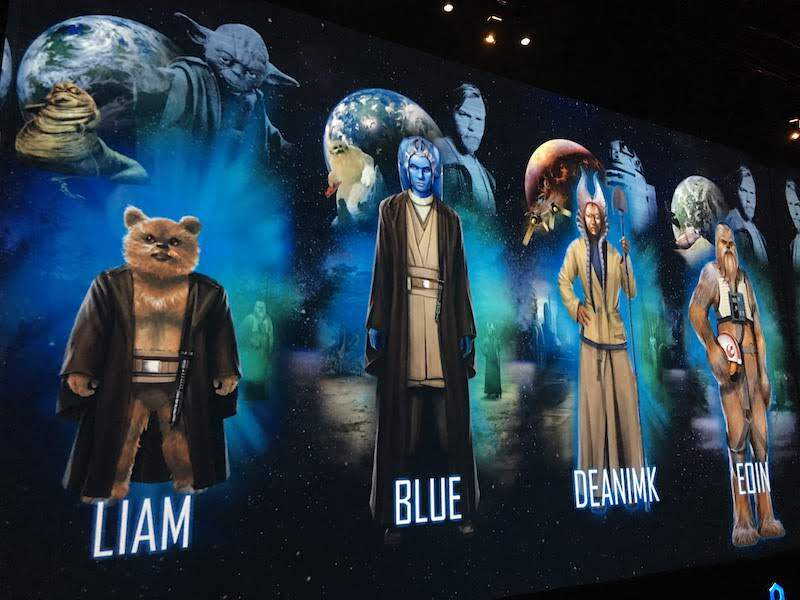 One of the exhibits was a Star Wars exhibit called Star Wars Identities. This was a really neat exhibit which took scenes and props from the movies and used them to explain how each person gains their unique abilities and personalities. It was really well done and we enjoyed it throughly especially as we almost had the entire exhibit to ourselves. 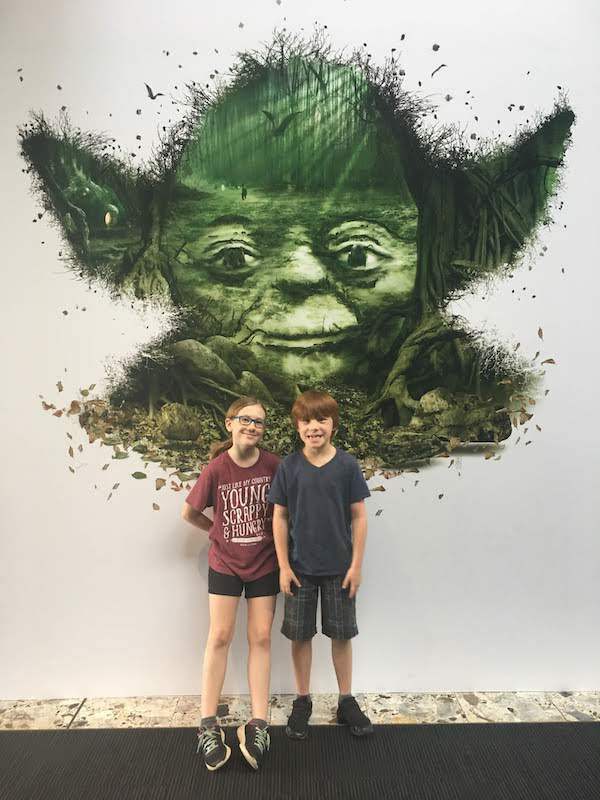 One of the cool things, that Liam and Siena enjoyed was the ability to create your own Star Wars character as you went through the exhibit. It was lots of fun but of course, there was lots more to see at the Museum. We didn’t nearly have enough time for it all. One of the more interesting visits we made was to Wendy’s Secret Garden. 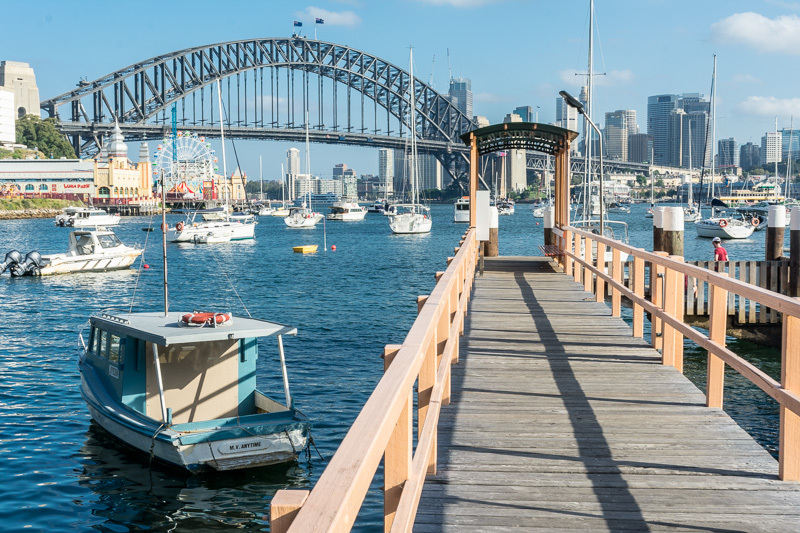 Wendy, who lived in the area on the other side of the harbour, had lost her husband, and to help her in her grief, she started to create a garden out of the area near her home. This continued for a while until she lost her daughter a couple of years later. The garden became her focus and she created an amazing area of trails and garden areas out of the wild brush. While the land was not hers, no one stopped her and she continued pruning, adding flowers and tending the trails she created. Now it is tended by volunteers and the city. It was a very private place filled with quiet nooks and sitting areas you could hide yourself in. The paths wandered through the gardens joining, diverging and rejoining through the gardens. It was fun and peaceful wandering through the gardens, exploring the paths and seeing where we ended up. 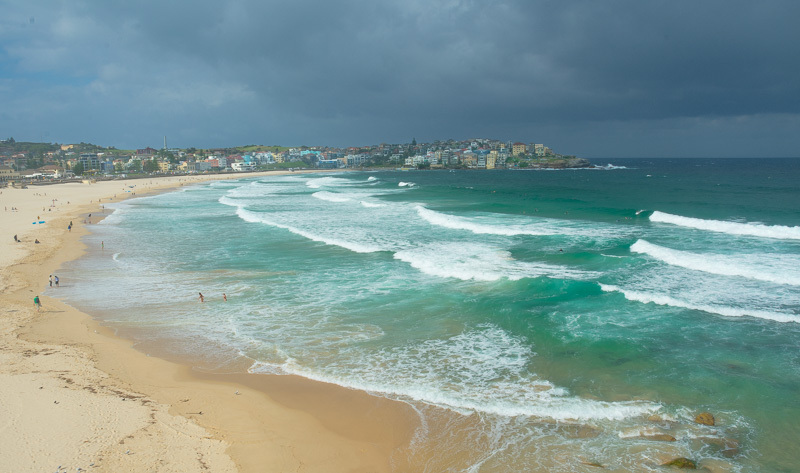 Our final stop was to Bondi Beach, made famous for its fantastic surfing. 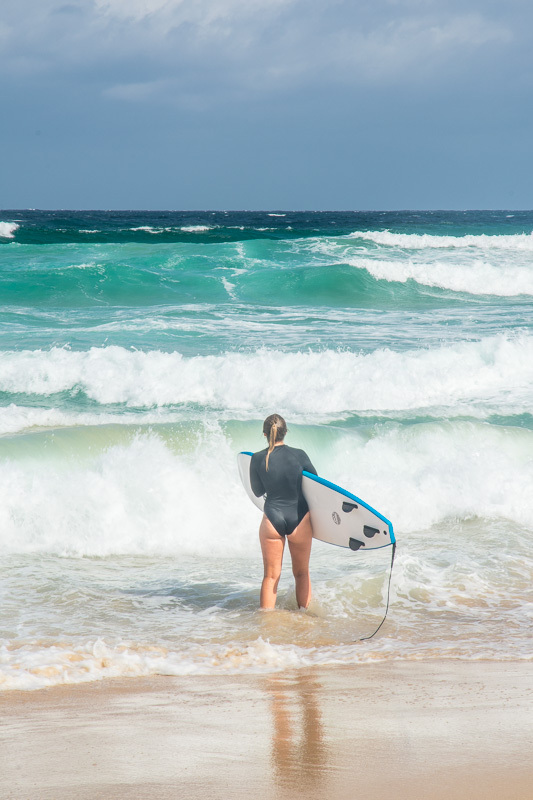 As we didn’t want to show any of the other surfer’s up with our surfing skills, we opted for just wandering along the beach trail. It’s a beautiful beach and, while there weren’t a whole lot of surfer’s there, we did get to see some braving the waves and the wind as we walked. 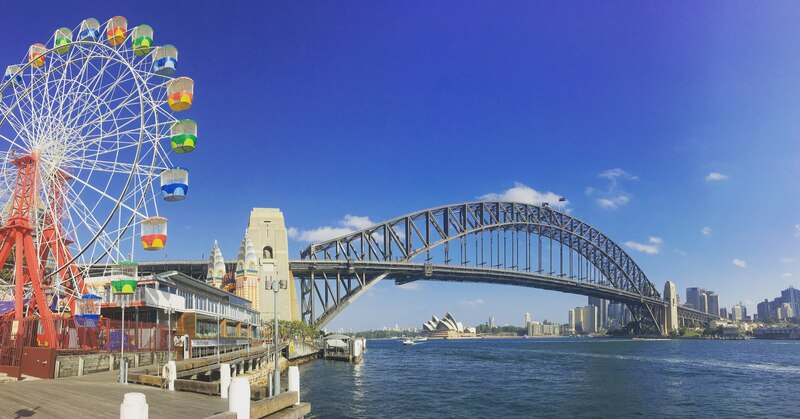 All too soon, our time in Sydney came to an end and we headed into the city one last time to pick up our rental car. 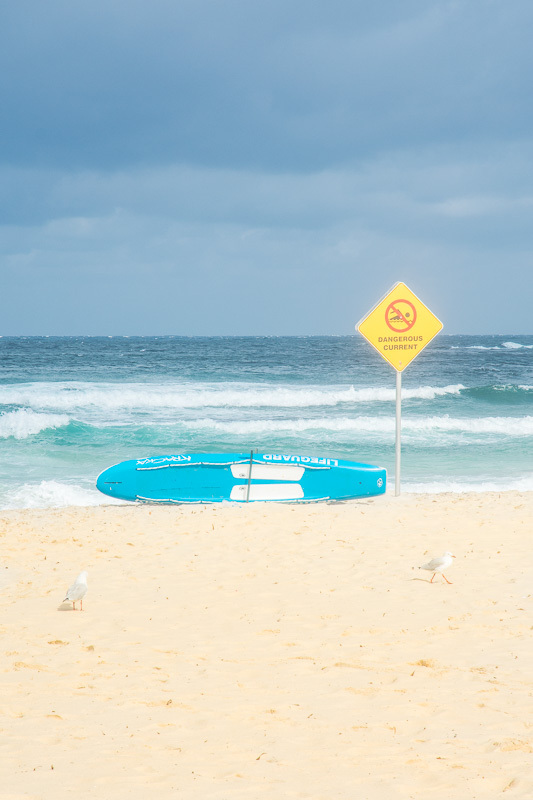 We were heading on our way up the Gold Coast to Queensland. First, we had to get out of the city, which was an adventure all on it’s own. But that’s for another post. We had seen so many neat things already. 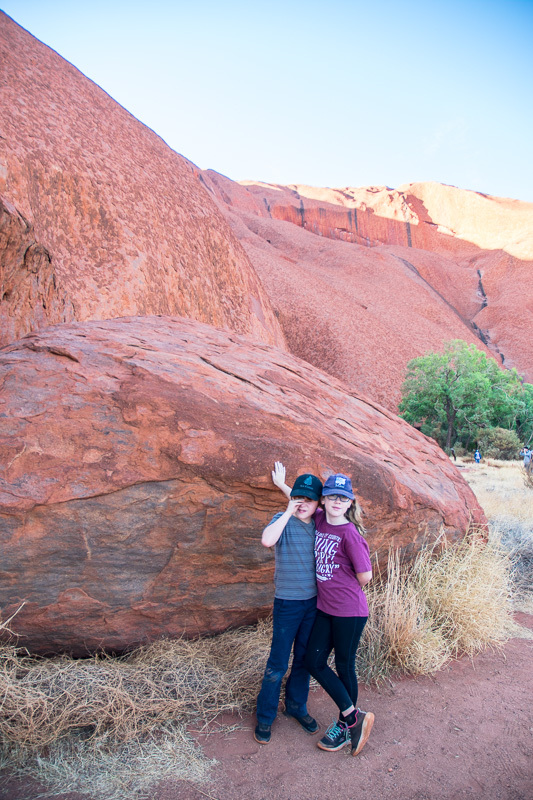 Uluru and the Sydney Opera House were at the top of the list of our favourite sites but we knew there were more adventures awaiting us.